2220 S 240th Place, Des Moines, WA 98198-3909. Our phone number will remain 206-232-4588. Beads, Beads, Beads…Hold a bead in your hand and feel its texture, gaze at a bead and see its beautiful colors and delicate patterns. What’s so great about beads is that they are made from simple materials that have been around for centuries – clay, glass, metal, and stone. The practice of treasuring and wearing beads began long, long ago. 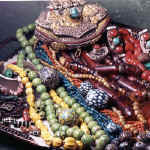 In ancient Egypt practically everyone wore beads on their clothes as well as jewelry. People wore beads not only for decoration, but because they believed that the beads had special powers to heal and protect them. Beads often end up far from the places where they were made. In the past, a traveler often gave beads to his host as a gift. The host might keep the beads or give them to someone else. That’s how beads spread from one region to another. If beads could talk, what stories they could tell! Beads were also used in place of money. Imagine a beadmaker in India or Venice, hundreds or even thousands of years ago, who earned his living by making beautiful glass beads in colors of brick red, corn yellow, and sea green. People in territories as far away as China and Africa fell in love with these beads and traded very special goods such as gold or pottery to get them. The Venetian whiteheart has been found in Africa, Indonesia, Southeast Asia, and the Americas. As you can see, beads really got around. We directly import trade beads, silver, brass, copper, bone, shell beads and components from Thailand, Laos, Burma, Nepal, Indonesia and India. $50.00 wholesale minimum purchase required (excluding shipping). Orders less than $50.00 are subject to a $10.00 handling charge. Washington residents must provide a valid copy of their Washington Reseller’s Permit. Visitors to the state of Washington must have a valid Business License issued by their state of residence and complete a Certificate of Exemption. This does not apply to orders shipped out of state. We will ship your order by UPS Ground or US Postal Service Priority Mail, unless requested otherwise. The USPS increased their Priority Mail Rates effective 1/27/19. For domestic shipments, Small Flat Rate box is $7.90; Medium Flat Rate box is $14.35; Large Flat Rate box is $19.95 (Insurance will add to these amounts). Most International orders will be sent by US Postal Service Express Mail. Small Priority Mail Flat Rate Box to Canada is $26.85, to Mexico is $33.60, to most other countries is $36.70. The order must be valued under $400 and weigh less than 4 pounds to use this service. Priority Mail Tracking is not available to all countries. Our site is not set up to calculate shipping charges, we will add the actual shipping charges to your order.